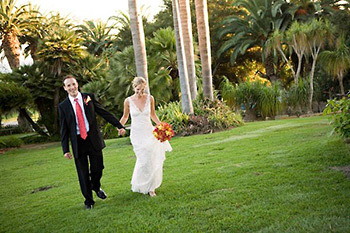 With its exotic gardens, majestic ocean view, and its diverse animal collection, the Santa Barbara Zoo is the ideal setting for your wedding and reception, or any occasion, and offers your guests an experience they'll never forget. 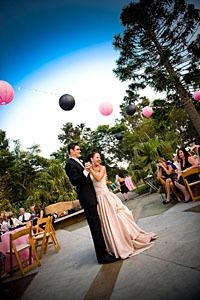 From its gorgeous Palm Garden to the magnificent views from the Hilltop, the Zoo is unparalleled as the site for an outdoor ceremony and reception. 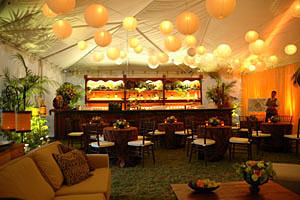 We accommodate daytime and evening events, from elegant weddings or dinner parties to relaxed company picnics. 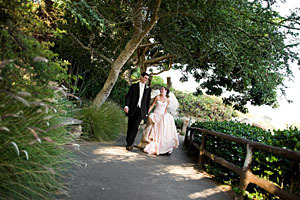 Whether you are planning a wedding reception, private dinner party, anniversary celebration, birthday party, baby shower, corporate conference, important business meeting, retirement party, holiday party or any special occasion, the Santa Barbara Zoo has a variety of event venues that can accommodate groups from 10 to 2,500. Full service catering & rental services, event coordination, and special Zoo entertainment options make this beautiful venue a stress-free option too. 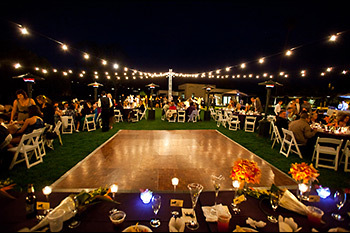 Whether your event is large or small, we have beautiful venues that are just right! With magnificent views of the ocean and mountains, this large grassy area is the perfect site for elegant dinners, wedding receptions and company events. The Hilltop also boasts a brand new facility, completed in March 2009, which houses a bridal changing room & private restroom, a catering kitchen for Zoo Catering Services by Rincon, and additional guest restrooms. 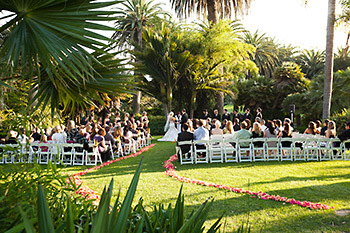 Our famous ceremony site, Palm Garden, envelops you in beauty and splendor providing an intimate setting for wedding ceremonies. 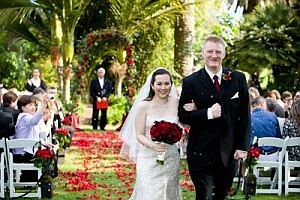 The site can accommodate a maximum of 250-275 guests. 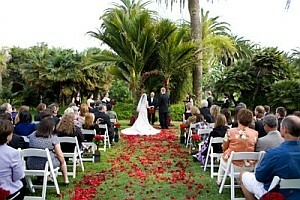 Ocean peek-throughs, lush tropical landscaping, and privacy make Palm Garden an ideal location for any ceremony. 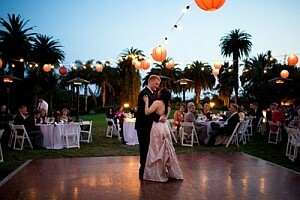 A terrific alternative for receptions, the courtyard is an open area that features a Koi pond. This area is available from 7:00 a.m. to 9:30 a.m. for morning events such as company breakfasts; for evening events, setup must begin after the Zoo closes at 5:00 p.m. Please contact us for details regarding Entrance Courtyard availability. 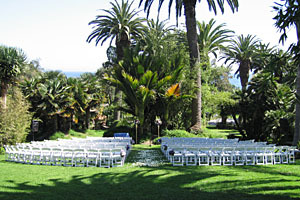 Otherwise known as the "little hilltop," this lawn area is a beautiful expanse of grass with ocean views and plenty of trees. This area is excellent for small weddings, company picnics or retreats. Zoo Catering Services by Rincon has everything you need to create the perfect event, and will assist you with all of your catering, beverage service, and rental needs. From formal plated dinners to casual BBQs, menus and service styles can be customized to your style and taste. With outstanding facilities and great service, complemented by sumptuous menus, our experienced and professional catering team will make sure your event is an affair to remember. Please contact us for details & menu pricing. All types of alcohol are permitted. 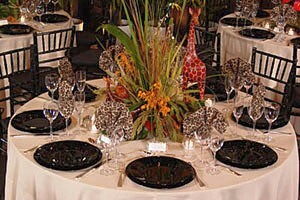 You may provide your own alcohol, or opt to have Zoo Catering Services by Rincon provide all alcohol. With either option, all alcohol service must be handled by Zoo Catering by Rincon. Please contact us for current pricing information as well as menus & catering pricing. The Santa Barbara Zoo is a private, nonprofit corporation. We are dedicated to the preservation, conservation, and enhancement of the natural world and its living treasures through education, research, and recreation. The revenue generated through private events goes directly to support the Zoo's mission and our operational expenses. CONTACT US TODAY TO START PLANNING YOUR WEDDING! Wedding Celebrations is a publication of Progressive Publishing © 1996-2014. All rights reserved.